Come out to help us plan for our first mural in Walnut Cove. We are planning to include a positive quote on the side of Alley’s Vintage Shoppe on Main Street. We will meet at the library to discuss pictures and a design. Be sure to collect images of your favorite inspirational quotes. Stemming off the Celebrating Courage event, we will explore John L. Hairston’s contribution to building Walnut Cove and the area through his efforts with the Yadkin Valley Economic Development District, Inc. We will consider ideas for what we would like to see as part of a post-excavation phase of coal ash from Belews Creek. This is part of a monthly series held at the Walnut Cove Public Library. The purpose is to make art, discuss what you would like for the final installation of The Lilies Project and to hang out with our neighbors. Maybe even make new friends. Spread the word via Facebook Events! 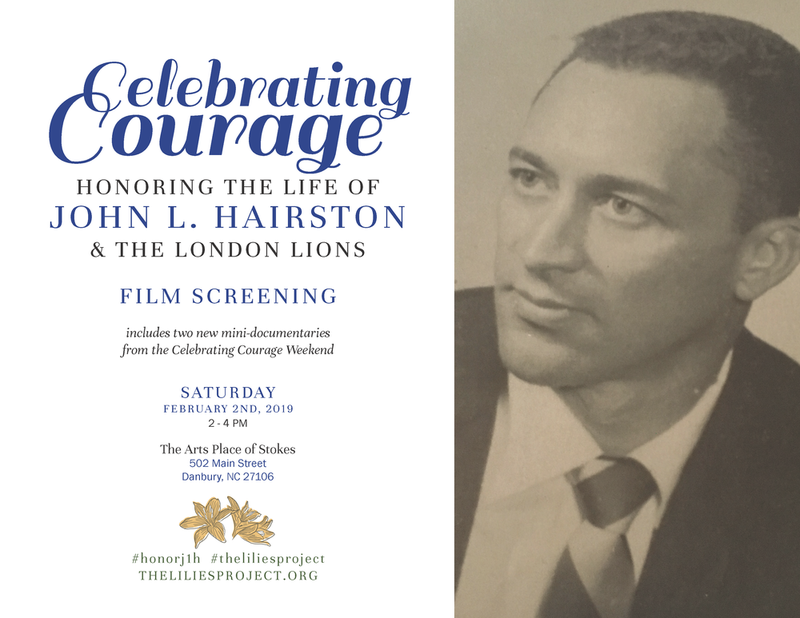 Friends of The Lilies Project will host a second community screening of Celebrating Courage, a short film honoring the legacy of John L. Hairston. Soul Ash Pictures created the film and it was originally showcased during the Celebrating Courage Weekend hosted in August 2018. The film will be shown from 2-4 pm at The Arts Place of Stokes in collaboration with the Stokes County Historical Society. The original documentary has been edited to include a few additional photographs and documents found over the last few months. Two new short films, both at 9 minutes in length, will also be shown. These films capture the spirit of the three-day weekend and also share comments that attendees had about John L. Hairston’s impact on their lives. See more about our Celebrating Courage series, including previews, photos from the weekend and other details. Residents for Coal Ash Cleanup will host an information session about Duke’s Final Closure Plans at the Walnut Cove Public Library. Representatives from Southern Environmental Law Center and Appalachian Voices will present Duke Energy’s final closure plans and answer community questions. Community members are also encouraged to submit comments to the Department of Environmental Quality during the meeting in writing or via email through Friday, February 15th, 2019 using the email address belewscomments@ncdener.gov. We will host a Residents for Coal Ash Cleanup Meeting to strategize the ongoing push to advocate for Duke’s full excavation of the coal ash from the 12-million-ton basin. On January 10 at 6:00 p.m. at Walnut Cove Elementary School (1211 Walnut Cove School Road), NC DEQ will hold a public meeting to discuss whether Duke Energy should be allowed to leave millions of tons of coal ash in an unlined pit at Belews Creek, sitting in groundwater on Little Belews Creek, near Belews Lake and just upstream of the Dan River. PLEASE COME! And tell DEQ to make Duke Energy remove its ash from this unlined polluting pit to safe, dry, lined storage away from the lake and the river and out of the groundwater. This is being done at every utility (including Duke Energy) coal ash pit in South Carolina and at 8 other sites in North Carolina. Walnut Cove and Stokes County deserve the same protections and the same respect! After campaign pledge, N.C. Gov. Roy Cooper faces test on coal ash, by Elizabeth Outzs, Energy News, Thursday, January 24th, 2019. Citizens urge DEQ to excavate the coal ash, by Amanda Dodson, The Stokes News, Wednesday, January 16th, 2019. Community Weighs In On Duke Energy's Coal Ash Closure Proposals, by Keri Brown, WFDD, Friday, January 11th, 2019. Public Meeting Held Over Coal Ash Concerns, Morning News Briefs, WFDD, Friday, January 11th, 2019. Residents, environmentalists push for coal ash landfill, by Taft Wireback, Greensboro News & Record, Thursday, January 10th, 2019. Photos: A.C.T. Against Coal Ash and NCDEQ host meetings to discuss coal ash, by Andrew Dye, Winston-Salem, Journal, Thursday, January 10th, 2019. DEQ meeting set for Thursday, The Stokes News, Wednesday, January 9th, 2019. Duke offers another plan for Belews Creek coal ash, by Taft Wireback, Greensboro News & Record, January 9th, 2018. Public Meetings Set To Discuss Coal Ash Basin Closures For Belews Creek, Other Sites, by Keri Brown, 88.5 WFDD, January 2, 2019. Duke Energy’s flood maps reveal only part of the risk of a coal ash spill, by Lisa Sorg, The Progressive Pulse, NC Policy Watch, October 12, 2017. This is a first of a monthly series held at the Walnut Cove Public Library. The purpose is to make art, discuss what you would like for the final installation of The Lilies Project and to hang out with our neighbors. Maybe even make new friends. Do you have old videos? We want to create a community archive of all the old shows. Over the Christmas Holidays, friends of The Lilies Project invite you to come reminisce about The Gymnastics Shows that were held at Southeastern Stokes Middle School from 1973 through 1987. The Gymnastics Shows were legendary events that people still talk about today. Every spring most of the student body would put on a show for the entire community. It was a perennial favorite for well over a decade involving both the students at the school staff. The variety show included a wide range of outstanding acrobatic accomplishments to silly skits and choreographed dances to the latest pop music. Read more about finding this front page story from The Danbury Reporter from May 12th, 1983 and other related blog posts here. The gathering will be held on Thursday, December 27th, 2018 from 4 - 8 pm at Southeastern Stokes Middle School. The event will include a panel about the decade-plus event and chance to share your stories about the Gymnastics Shows. Old videos will be on display. We will begin planning for a spring performance event where the entire community is invited to showcase their talents. The event promises to be a fun way to reconnect with classmates during the holidays. Prior to the December 27th event, The Lilies Project is seeking copies of your old video recordings of The Gymnastics Shows. So dig through your closets and see which years you have on hand. VHS tapes will be digitized and archived to make as many of the annual shows available to the community as possible. If you have a story to share or any photos or videos, please contact Caroline Armijo at caroline.armijo@gmail.com or 919-358-5057. The Gymnastics Show Reunion, by Amanda Dodson, The Stokes News, November 14th, 2018. Come play around with sheet music and make a few Christmas Creations. The Lilies Project will lead an art project of image transfer using collage and water from the river. Plan to join us in the children's area. More details to follow. A very full day in Stokes County working on #theliliesproject, including a visit to London Elementary. We will honor the legacy of London Elementary School and its role in our community. We will also honor John L. Hairston, the school principal, who would be celebrating his 100th birthday this year if he were still with us. The event is in collaboration with the Stokes County Historical Society, the Stokes County Arts Council, Residents for Coal Ash Cleanup, and Appalachian Voices. "An Appreciation of a Man From Another Time," by Madison Taylor, The Times-News, Burlington, NC, June 12, 2015. "Saura Town: Once a Busy Hub," by Meredith Barkley, Greensboro News & Record, Interview with John L. Hairston about local history of Saura Town Plantation, June 29, 1993. "New film showcases school principal's fight against injustices during civil rights movement," by Margaret Johnson, WXII News12, Friday, August 10th, 2018. "Local pioneer to be honored for role in school integration this weekend," by Margaret Johnson, WXII News12, Friday, August 10th, 2018. "Al Gore to Speak at Ecological Justice Organizing Tour in Greensboro Monday," by Jessica Winters, WFMY News 2, Sunday, August 12th, 2018. "‘We know who the villain is,’ Gore tells crowd near Duke’s Belews Creek plant; neighbors blame illness on coal ash," by Lisa O'Donnell, The Winston-Salem Journal, Monday, August 13th, 2018. "Photos: Al Gore stands in support of Belews Creek residents," by Walt Unks, The Winston-Salem Journal, Monday, August 13th, 2018. "John L. Hairston leaves lasting legacy," by Amanda Dodson, The Stokes News, Wednesday, August 15th, 2018. "Al Gore stops in Stokes County," by Amanda Dodson, The Stokes News, Wednesday, August 15th, 2018. "Al Gore, Rev. Barber tour coal-impacted communities in N.C.," by Ridge Graham, Front Porch Blog, Appalachian Voices, Wednesday, August 22nd, 2018. "A Leader in the War on Poverty Opens a New Front: Pollution," by Kendra Pierre-Louis, The New York Times, Friday, August 24th, 2018. Join us for our monthly Residents for Coal Ash Meeting for updates of latest happenings. Bring a gallon of your contaminated well water for a collaborative art project led by Boone resident, Michael Weiss. We will have a planning meeting for the Celebrating Courage event at 4 pm following the RCAC Meeting. This is a recurring event from April - November. Join us for our monthly Residents for Coal Ash Meeting to learn about the Mountain Valley Pipeline and upcoming summer events. 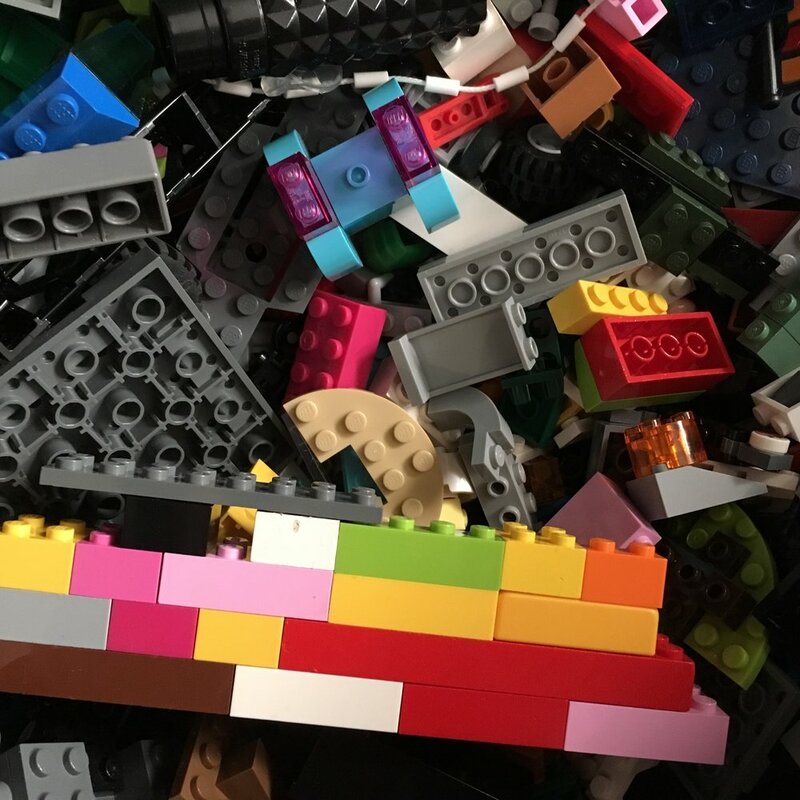 This workshop is focused on building our creative toolkit as educators and learners, and our capacities as individuals-in-community to move out of systems of oppression, assimilation, and uneven methods of attending to racist violence and white silence. The workshop is rooted in InterPlay forms that center the body, breath, and intuitive story, movement, and song forms to create more ease, spaciousness, and respect in places where they can be of deep benefit. Changing the Race Dance uses fewer words and more body-based wisdoms to identify and practice ways of dislodging the harmful effects of a white supremacist social order that we face daily. Incorporating restorative and contemplative practices and the sometimes-radical act of improvisation, the workshop focuses on bolstering our skills to unpack inequity to its roots, and discern and celebrate what's working in people-based movements toward freedom and change. InterPlay forms are accessible to all physical mobilities and experience levels. The Lilies Project is sponsoring transportation costs to the event for Stokes County residents. Leaders: Soyinka Rahim, founder and director of OurThing Arts Company, and Cynthia Winton-Henry, InterPlay cofounder. Cost: Suggested donation $5-50, for those who are able. Participants must attend entire weekend. Free homestays can be arranged with advanced notice. Canceled due to weather and illness. Join us to get more involved on the actions taking place to clean up coal ash in the community. Royce Moore was a colorful character, whose family opened Moore's Springs in Danbury. He grew up at the Moore's Springs Hotel a delightful interview with Royce Moore, who grew up at the Moore’s Springs Resort Hotel in Stokes County in the early 1900s. Mr. Moore was 99 years old when this interview was filmed for the Stokes County Historical Society in 2009. This will be the kick off and introduction to oral history collecting for “The Lilies Project”, a National Creative Placemaking Fund Project, celebrating history, environmental awareness and art for Stokes County. Free and open to the public. After the film, we will collect information about what research is already underway in Stokes County ranging from early settlement in the area through current day stories. We plan to map out information to see what we already have, where they overlap and what stories are missing. Use these forms to share your ideas on what stories you would like to explore. We may share this mini documentary by Christine Rucker featuring Tony McGee. Profile on local grass roots trail builder, Tony McGee. McGee turns to community of bikers and outdoor enthusiast to create a 9 mile trail on back side of Sauratown Mtns. in Stokes County, NC. For new audio collections, we plan to use StoryCorps DIY App and create community pages that are easily accessible. Are you ready to dive in now? These are a few online resources to get started. Local citizens cleaned up the litter on the streets of Walnut Cove, NC on St. Patrick's Day 2018. Following the event, Clean the Cove organizer Adam Flinchum hosted a chicken stew in Flower Park. We planted flowers donated to the community by Paul J. Ceiner Botanical Garden and Old Salem. The Lilies Project, the producer of this short film, is a National Creative Placemaking Fund Project, funded by ArtPlace America, to create art out of coal ash in Walnut Cove, NC. For more information, visit theliliesproject.org. Thank you for all who came out to collect up litter Saturday morning (8 am - 12 pm) and returned for and chicken stew (5 - 8 pm) in Fowler Park. Adam Flinchum organized various routes. The Walnut Tree Community provided water and refreshments at stations throughout town. Over 1200 pounds of litter was collected! There is even more trash to collect. Please take an active role in preventing litter. It makes a tremendous difference in the appearance of the community. We planted a collection of native plants donated by Old Salem Museum and Gardens and Paul J. Ciener Botanical Gardens. Great Blue Lobelia -- part-shade, like moisture; height 36", violet blue flowers in late summer; re-seeds. These flowers were planted a long the creek bed in Fowler Park. Spring Blue Phlox -- sun to part shade; height 12", fragrant lavender blooms in early spring, ground cover that will spread. These flowers were planted in the front garden bed at the entrance to the Walnut Cove Public Library. Thank you to Paul J. Ciener Botanical Gardens for donating eight day lilies, which are a vibrant red variety known as Peace. They were planted in Fowler Park and next to the tree at the entrance to the Walnut Cove Publice Library. In collaboration with the Clean the Cove, we will continue collecting input on where to plan to plant lilies, daffodils and accompanying bulbs this fall. Please share your locations in the comments below or record them in the large, black notebook at the next event. Join us to get more involved on the actions taking place to clean up coal ash in the community. UNC Well Empowered will present an overview of their research findings. Join us to watch the 1963 film "The Lilies of The Field" for which Sidney Poitier received the first Oscar by an African-American actor. The theme song for the film was written by Jester Hairston, who was born at Belews Creek. This film and Jester Hairston's "Amen" are the inspiration behind The Lilies Project, the National Creative Placemaking Fund grant, recently launched in Walnut Cove. The film screening will happen at the Arts Place of Stokes in Danbury. Afterwards we will create a hands-on collage art activity. Please join us. This event is free and open to the public. Share this event with others on Facebook! Join us for our quarterly statewide meeting with presentations on "How to Sustain" by Rev. Woodberry and "How To Replenish" by Marie Garlock. The film screening will happen at the Walnut Cove Public Library. Afterwards we will create a hands-on collage art activity. Jester Hairston, accomplished composer and musician, was born in the Belews Creek Community known as Little Egypt, prior the land that being flooded to create Belews Lake. We gathered to celebrate his accomplishments through film, songs and art. A Hairston Celebration: Films explore history, legacy of black slaves and white descendants from NC and VA plantations, by Lisa O'Donnell, Winston-Salem Journal, January 26th, 2018. Filmmaker continues research on Hairston documentary, by Amanda Dodson, The Stokes News, January 17th, 2018. Bigger Than You Think, by Leslie Bray-Brewer, The Stokes News, January 17th, 2018. Dr. Martin Luther King, Jr. Remembered, by Amanda Dodson, The Stokes News, January 17th, 2018. Tag your musical tribute to Jester Hairston with #JesterSings.